Home » Why Do Horses Have Manes? Discover The Fun Facts! Why Do Horses Have Manes? Discover The Fun Facts! Mane is the hair that grows from the top of the neck of a horse to the withers. It normally grows to cover the whole neck of the horse and tend to be thicker than the horse’s coat. Horses are not the only ungulates which have manes. Other hoofed mammals, such as giraffes, wildebeest and oryx antelopes have manes, too. The interesting thing is, there may be many different reasons why horses have manes. 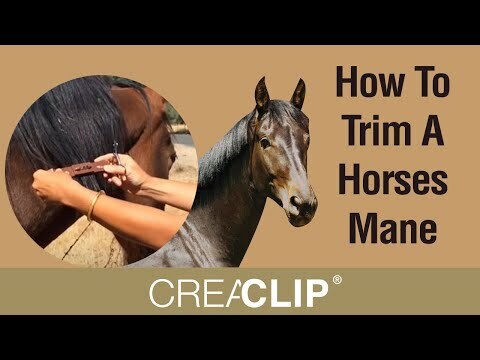 Why do horses need manes? So, how fast does horse mane grow? Do you know the reason horses need to have manes? Did you know the reason horses need to have manes? Overall, upright manes bring a huge advantage because they help protect to the back of the horse’s neck. They help drain water from the neck when it rains, keep the horse’s head warm when it is cold. They also are the tools to prevent bites from insects and bugs. When the horse shakes its head, the mane will flick over from side to side and swat bugs from there as well. Stallions might grow a thicker mane than mares. But the reason is not to attract the other gender. When stallions fight, they tend to bite each other's necks. So, the manes act as a sort of armor to protect a horse from its enemies. Another possible reason to have a mane may be that it can indicate a clear signal of the animal’s physical health. Horses that carry beautiful mane around are likely to be strong and healthy, while those with patchy or sparse manes tend to be in the bad condition. After domestication, modern domestic horses are bred to grow longer manes. Not only long forelocks can ward dust off a horse’s eyes, but they also help horses have a more attractive appearance. It depends on genetic and environmental, seasonal, diet factors. Often, heavy breeds like cobs and draft horses will have quicker mane growth. According to a study, a horse’s mane will grow anywhere from half an inch to 1.5 inches in a month, depending on the breed of the horse and other external factors. Owners who care for their horses have different ways to keep the manes of their animals being beautiful. Some people braid the manes, others comb them out, and others keep them cut short. After that, you may ask yourselves: Do horse feel their manes, especially when being pulled? The answer is yes. A recent study has demonstrated an increase in the heart rate of horses having their manes pulled, which showed a sign of stress. So, if your horse is too sensitive, don’t pull their manes often. Instead, you can take small sections at a time, pull in an upward direction or trim manes with scissors. Well, the mane can be beneficial to a horse in many ways: keep the horse’s neck warm, ward off water from the neck, protect a horse from irritating insects and other enemies, etc. If you are a horse lover and you want your animals to grow healthily, remember to take good care of their manes also, that can also make your horse love you more!